This page is a translated version of the page Matador and the translation is 100% complete. The Matador brand belongs to Siebert & Löwen, founded in 1895 by Adolf Siebert and Ewald Loewen and operating in the production of office supplies, with production in Wuppertal-Elberfeld(?). 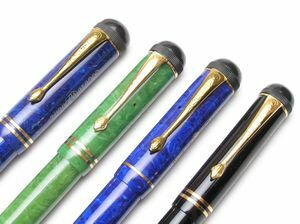 It is not known an exact date for the fountain pens market entry, but activities in that field can tracked back at least at 1911, date of the first known patent (nº FR-431385) for a safety. The production of the beginning of the 20s was aimed at creating economic pens of good quality, with a very good quality/price ratio. The company is also known as Standard-Matador. Around 1949 it produced what is probably the first sealing snap cap, with the model called Matador-Click, by the sound that characterized the proper closure of the cap. Names of other models are: Matador Dipless, Matador Express, Matador Standard, Matador 811, Acca, Turbo-Matador. ↑ this year is cited in an Andreas Lambrou book as probable, but in this discussion is also cited 1946 as another possible date, while the 1936 seen in some papers cannot attributed for sure to a Matador 120 Click. This page was last edited on 29 January 2019, at 02:02.